After swatching High Spirits I felt the urge to compare it with another Essence polish from a Trend Edition that came out in the same period, as at a first glance they seemed really similar. 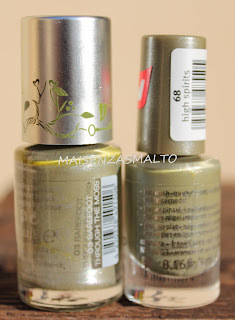 Actually I tried really hard to catch any differences between them: they only thing I noticed is that Barefoot has a little bit more silver shimmer so it seems slightly lighter, but I think that they are so close that a normal person (not a polishaholic) could consider them dupes. Do you agree? Mi sono concentrata un sacco per trovare le differenze tra i due, l'unica cosa che ho notato è che il Barefoot ha giusto un po' di shimmer argento in più, quindi pare leggermente più chiaro. Ma tornando nel mondo delle persone normali (e non delle malate di smalti) direi che sono così simili da poterli classificare come come “doppioni”. Che dite?